Montego Bay Cruise Brochure - Barrett Adventures the Real Jamaican Adventures. Description: For those who want a really superior waterfall with a great tubing adventure, try this spectacular combo! Enjoy the serene climb up a beautiful waterfall in the midst of fabulous rainforest and then go tubing for the rest of the afternoon at Yardy River Tours. Description: If you can't come to Jamaica and NOT climb Dunn's Falls, allow me to suggest the best way to do it. There are an average of 3000 people per day on Dunn's, holding hands in long lines who won't let you cut through them at all. We have started taking our guests early, so we arrive at the falls at 8:30AM just as the ticket booth opens. If your ship isn't in early enough for the opening, we can still do it without thousands of others if we do Secret Falls first and then to Dunn's in the afternoon. Description: This is the ultimate ZIP for those of you who love zip lines already, or who want to experience one extraordinary one for the first time. The rainforest is spectacular and the fun is non stop. Board a 6X6 vehicle for a nature tour on the way to reach the start of the zip, spend a few minutes for instructions and then off you go on the ride of your life. They start with a mere 250 foot line to warm you up and finish up the 5th section with a 1600 foot long ride. It is incredible and better than any other zipline offered in Jamaica. It is combined with Tubing, Kayaking, or Bamboo Rafting. If you want shopping, beach or Margaritaville on the way back to your hotel or ship we will take you to do whatever you like for an additional hourly fee. Description: Fun for all levels of experience. If you have never dived before, you can take a resort course. Spend the morning in the swimming pool, learning what you need to know and then do a 30' dive in the afternoon. If you are certified, you can choose a deep and shallow dive combination for the day. If you are staying on the island and want to get certified or add a higher certification, that is also possible. Description: A forty foot Jeanneau is available for day cruises and charters around Jamaica and neighbouring islands. This is NOT a booze cruise. This is Carolyn’s private boat. A day sail will take you for a lovely sail up the coast, stop for snorkeling and lunch. Description: Delight to a wide selection of up and coming Caribbean artists. Haiti and Cuba are particularly well represented. Whimsically coloured carved furniture and objects from the gallery's own workshop are also displayed. Description: Fishing on the North Coast is deep sea fishing with a local twist. This is for those who don't care about all the comforts of a fancy deep sea fishing boat. A quick and easy way to get to a lovely reef with lots of colourful fish. Take a ride in a Jamaican Canoe (a long slim motor boat) to the airport reef and snorkel to your heart's content. Stay as long as you like (not the 15 minute booze cruise snorkelling) and then come back to Whitehouse Beach where you can have fresh caught lobster done to perfection by your Captain, Loxley. Pricing for Lobster lunch is designed for groups of 6 or more, for pricing for 5 or less ask for a quotation. Snorkelling only is for 2 persons or more. Description: This is the most fun horseback riding ever. 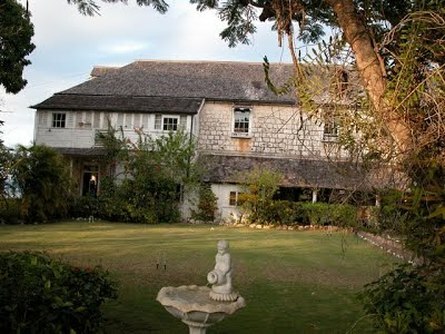 Rhodes Hall is a 580 acre plantation that has mountains, bamboo groves and it's own private beach to gallop on. Description: Lovely waterfall only twenty miles from Montego Bay. Spend a morning following your own personal guide up a bubbling falls. Description: Visit some of the unspoiled locations in Negril. Go snorkelling on the cliffs; enjoy the solitude of the beach at Bloody Bay, an old pirate hangout, where local guys will cook fresh lobster for you. Stay for a romantic sunset and dinner on the cliffs. Description: The Appleton Estate is one of the older Rum Factories in the Caribbean. The plantation was in existence when the British captured the island in 1655. Appleton brand rum was established in 1749 and has long been considered one of the best brands in the world. During World War II, they upped their production in order to replace whiskey, which was in short supply. As a result of there efforts, their blended rums became famous for their quality. I have yet to find a smoother rum than the Appleton Reserve or Extra. This tour can be done by itself, or combined with YS Falls, Black River, or Pelican Bar. Description: An exciting day spent travelling through the cockpit country where the Maroons held off the British for eighty years. Hear the fascinating story of CUDJO and the treaty of 1739. At YS FALLS swim into a cave under the falls, swing off a rope into the water and lie in the sun in the midst of a rainforest-garden. Description: This day is an adventure and a half!!!!! Everyone's classic dream of the Caribbean is played out here. It takes no imagination at all to feel like Humphrey Bogart or Ingrid Bergman (or maybe Brad Pitt or Jennifer Aniston, depending on your age). This picture is one of my all time favourites, but the bar has been rebuilt after Hurricane Ivan and has a wonderful sundeck now. Description: Add any one of the following to the tour: YS Falls, Black River or Appleton Estate. Description: I have found an 'off the beaten path' sort of tubing adventure that is on a great river which no one else has discovered as yet. Take the same trip to YS Falls that is described in the other South Coast Tours. Description: The Canopy has just had two new sections added to it.n It now takes over an hour to do the Canopy and it is spectacular. If you want to try a lovely combination, you can't do better than the YS & Canopy. Description: Pass through the village of Usain Bolt, our world record holding, Gold Medal Olympian, adjacent to the caves. If you want to see rainforest at its most green and glorious this is a lovely way to do that. Hike through a dark and magical cavern on the edge of the Cockpit Country. Description: If you would like an adventure suspiciously akin to something out of INDIANA JONES AND THE TEMPLE OF DOOM, this is the trip for you! Spend a day or two (a home stay with some delightful residents of Albert Town can be arranged), exploring some of the most gorgeous countryside in Jamaica. Do everything you want to do, Dunn's Falls , Secret Falls, Dolphin Cove, Mystic Mountain, etc. for an hourly charge for transportation and make up the day as you go along.